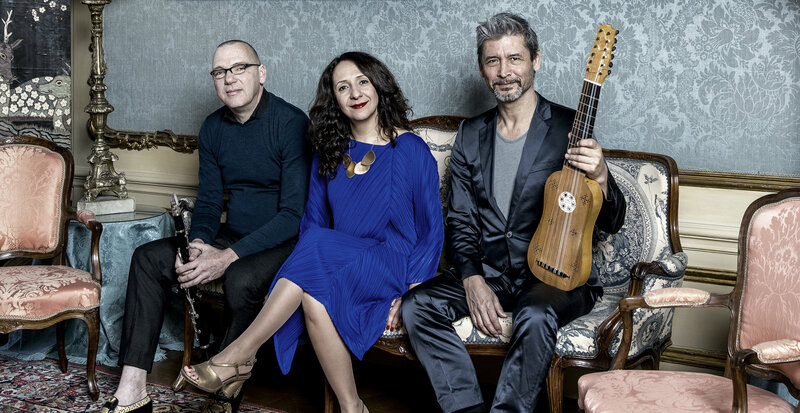 Lebanese singer Rima Khcheich’s enchanting voice, deeply rooted in the Arabic vocal tradition, Maarten Ornstein’s sonorous bass clarinet and the rich, superlative playing of Baroque musician Mike Fentross merge effortlessly in Muwashahat, a musical journey through the Andalusia of olden times. For this year’s Flamenco Biennial, this trio have put together a program of Spanish music from the late Moorish and early Baroque periods which clearly shows the extensive influence of Moorish music on composers from the post-Reconquista period and, later still, on flamenco. Both the theorbo and the vihuela have their origins in Arabic instruments and many elements from the flamenco singing style go back to the Moorish period. The Muwashahat, a 12th and 13th century Moorish/Arabic form of singing that is still in use today, gets a new musical look and will be heard alongside music from, among others, Alonso Mudarra, Luys Narvaez and from the Libre Vermell de Montserrat. Are you curious to hear flamenco’s first keynotes? Then join these three top musicians on their journey for an unforgettable musical night.